INB (Inland Northwest Bank) and the Spokane Public Facilities District (SPFD) announced the renewal of a ten-year partnership agreement designating INB as the exclusive naming sponsor of the 2,700 seat INB Performing Arts Center. Ten years ago marked the first sponsorship commitment from INB and allowed the financial support for substantial improvements to the historic building (built for Spokane's 1974 World Fair). In recognition for their support, the District officially changed the name (from the Spokane Opera House) to the INB Performing Arts Center in 2006. For more information about the INB Performing Arts Center, visit www.inbpac.com. 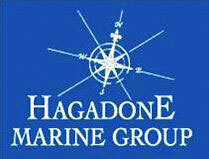 The Hagadone Marine Group made Boating Industry's 'Top 100 Dealers' list for 2015, ranking No. 12, up from 15 last year. Only the top 20 dealers are ranked, with the remaining dealers recognized as making the Top-100 list. Hagadone Marine Group, located on Blackwell Island, provides complete boating services on Lake Coeur d'Alene, with boat sales, maintenance, repair and warranty service, as well as wood boat building and restoration. They offer boat slips and moorage at three marinas, lake and charter cruises, boat rentals, fuel, supplies and other marine support and services. Campbell House Holidays runs through January 2 at the Northwest Museum of Arts and Culture in Browne's Addition. The historic home is decorated for Christmas, and open for visitors to explore the house at their own pace from noon to 4 pm except Christmas Eve when it closes at 3 and Christmas Day when it is closed. For more information go to northwestmuseum.org. Associated Industries announces a new partnership with the national law firm Jackson Lewis P.C. The strategic partnership between the two organizations provides a more robust service for Affirmative Action Plans that are compliant with the very latest and rapidly changing governmental regulations. The alliance and support combines the local, personalized resources of Associated Industries with the national expertise of Jackson Lewis bringing unmatched service to the Northwest region. Since 1910, Associated Industries has helped more than 1,200 member organizations in the Inland Northwest and beyond thrive as responsible employers with safe, hospitable workplaces. It serves as an outsourced team or extension of its members' HR, employment law, safety, and health benefit administration groups to protect and support their workforces. As the business environment changes and becomes ever more complex and regulated, Associated Industries keeps its members informed, prepared, and adaptive so they can stay productive and effective, no matter what comes their way. Learn more at or connect with Associated Industries via LinkedIn, Twitter, or Facebook. Associated Industries website is aiin.com. The Key Club at Deer Park High School will receive $2,500 through STCU's Hundred Dollar Project, for raising awareness about leukemia, and fund-raising to help two families with children fighting the disease. In addition, the Ferris High School Fashion Club will receive $1,500 for making colorful pillowcases to brighten the lives of sick children. And a student group at Lewis & Clark High School will receive $1,000 for Tiger Wellness, a program to help train students and teachers to recognize the signs of struggling individuals. Earlier this year, 37 teams of teens from Washington and Idaho submitted project ideas, and judges narrowed those down to 15 that received $100 each to help with the work. Each of the 15 finalists was invited to report back with a video showing how they used the $100 to do good. From December 5 through December 9, visitors to hundreddollarproject.org watched the videos and submitted more than 3,000 votes for the project they felt was most deserving of further prizes. To make the selection fair to smaller schools, winners were selected based on a combination of voting and judging. The Key Club used its $100 to host a volleyball tournament that raised $480 for the two Deer Park families. The November 18 windstorm forced rescheduling of the tournament, but the team persevered. They also took steps to raise awareness for the disease, distributing bracelets and providing information about the bone marrow registry. For its pillowcase project, the Ferris student group worked with the Spokane chapter of Ryan's Cases for Smiles, a national volunteer organization that has provided more than 1 million handmade pillowcases to children being treated at hospitals nationwide. In Spokane, the pillow cases go to Sacred Heart Medical Center, which provides services to 35,000 children each year, brightening the young patients' rooms and giving them something colorful to take home. Lewis & Clark students offered professional training to teachers and students for helping classmates who are struggling emotionally, or may be feeling suicidal. The participants wear small ribbon pins, letting students know that they are willing to lend a listening ear. They also lead activities designed to help draw lonely students into the Tiger community. See videos produced by the three winning teams at hundreddollarproject.org. The Community Colleges of Spokane's Center for Workforce and Continuing Education has been honored for excellence in the Best Marketing category by the Learning Resources Network (LERN), the world's largest lifelong learning association. The winning entry, designed by CCS's Public Relations and Marketing Department, was included in a showcase of internationally exemplary programs at the 2015 LERN Annual Conference in New Orleans. Information about the submission was on display in the conference Hall of Learning throughout the three-day conference, December 2-5. In addition, the winning programs will be featured in future LERN publications and on LERN's website. Laurie Beusan. a REALTOR with 8 years of experience, has joined Prime Real Estate Group as an agent at the agency's new Riverstone office in Coeur d'Alene. Meridian Construction, Inc. of Spokane has just completed the $552,000 Phase 1 of a healthcare renovation consisting of a building addition and interior remodel to the existing Community Health Association of Spokane (CHAS) located at their Downtown Denny Murphy Clinic. This work included a new main entry, waiting room, reception desk area, exam rooms, and pharmacy. Phase II of this renovation just commenced and was awarded to Meridian for $450,000. This work includes remodeling the existing exam rooms, restrooms, lab stations, and other various support spaces. Meridian Construction, Inc. has constructed other healthcare projects such as the recently completed Orthopedic Specialty Institute located on Fifth Avenue by Providence Sacred Heart Medical Center. New Year's Eve excitement begins with a performance of Beethoven's Ninth Symphony by the Spokane Symphony at the Martin Woldson Theater at the Fox starting at 9pm on Thursday, December 31 and will continue at the Davenport Hotel's Grand Pennington Ballroom with dancing until 1 am. 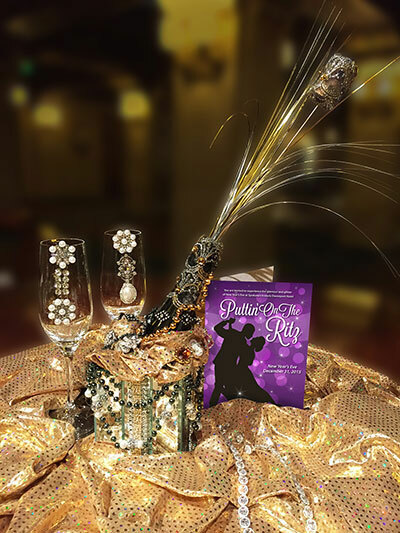 'Puttin' On The Ritz' gala celebration will include live entertainment, hors d'oeuvres, door prizes, special late night fare, midnight champagne toast and more. A no-host bar is available. The event is black tie preferred. Complimentary social dance lessons will be taught in the Hall of Doges and will provide basic steps to music being played in the Grand Pennington. 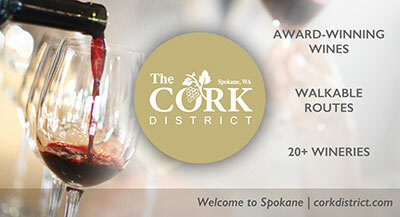 The gala is presented by Spokane Symphony Associates and Bozzi Media as a fundraiser for the Spokane Symphony. For ticket information, visit www.spokanesymphony.org or www.ticketswest.com or 800-325-SEAT. This is a great way for Spokane to kick off the New Year and find ways to reach those New Year's Resolution Fitness Goals. The Spokane Health & Fitness Expo will be at the Spokane County Fair & Expo Center Saturday, January 9 and Sunday, January 10. You'll find everything health & fitness under one roof. Included in this inaugural Expo: Free Fitness Classes on the Athleta Main Stage (sign up online at SpokaneHealthFitExpo.com), Meet Fitness Experts on Yoga, Pilates, Spin, Bar, Strength Training & more. Free Fitness Tests by A Personal Fit, Army National Guard - 30' Rock Climbing Wall. Shop fitness equipment, apparel, supplements and more. There will be free samples and a wine bar too. Hours are Saturday, January 9, 10am to 6pm and Sunday, January 10, 10am to 4pm. 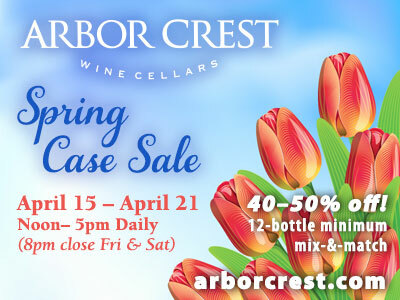 Admission is $8 for adults, $4 for kids ages 6-12, cash only, good all weekend. Parking is free. For more information, visit SpokaneHealthFitExpo.com, find them on Facebook and Instagram. For the past 15 years, Klundt Hosmer has designed the posters and buttons to promote First Night Spokane. 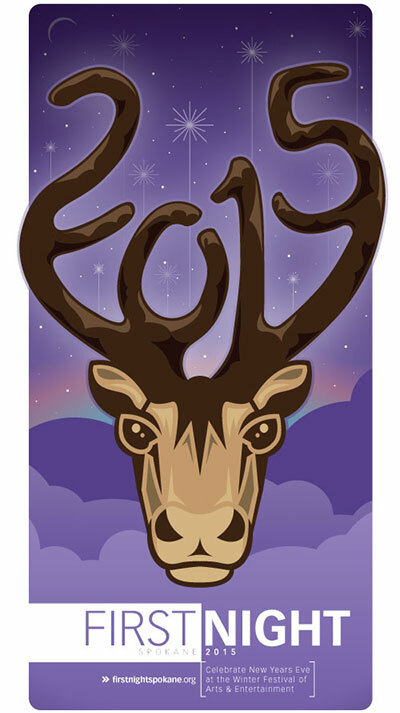 This year, the poster features an illustration of Dru, a time-keeping caribou, who plays a important role in the events leading up to New Year's Eve. The Legend of Caribou Dru is brought to life in a short video produced by Klundt Hosmer and Hamilton Studio, which can be viewed at www.klundthosmer.com/CaribouDru. To support the arts in Spokane, Klundt Hosmer has volunteered close to 1,000 hours of design work since 2000 to create the poster images associated with First Night. Ross Printing, another partner of First Night Spokane, has regularly joined the cause by donating the printing of thousands of posters and other promotional materials to help Klundt Hosmer's vision come to life. Visit Spokane announce the appointment of Robert Enriquez to the role of Vice President of Sales and Marketing. Robert has worked in the tourism industry for more than 20 years, with experience at large convention hotels and destination marketing organizations. Most recently, Robert worked at the Albuquerque Convention & Visitors Bureau. In his new position, Robert will lead the sales and marketing departments, and provide strategic input, at Visit Spokane. Scott Somers joins Stantec Inc.
Stantec Inc. has hired Scott Somers as a senior architect. Somers, with more than 26 years of diverse industry experience, previously operated his own firm, ARCH-101. He has served public and private clients, focusing on design of health care, dental, and orthodontic projects nationally and abroad.